TUCKER'S CONE ART POTTERY KILNS - BX2336D Deluxe (12 Cubic feet) In-stock and ready to ship. All TUCKER'S kilns are built with electronic controllers. 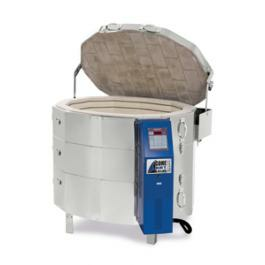 The Tuckers Cone Art Kilns Model BX2336D is a large 12 cubic foot oval kiln with a full 36" width. It has been designed especially for the busy production artist and sculptor studio that need the extra width. It is a double insulated kiln with a wall profile of 2.5 " premium firebrick plus 1" of block insulation. The extra insulation ensures a cooler, safer jacket, longer element life, and approximately 30 % savings in electricity costs. The kiln is clad in a stainless steel jacket for extra protection and durability. There are heavy-duty Kanthal A-1 elements in the walls and floor. This makes firing to cone 10 a breeze even with high mass loads. This kiln is equipped with a counter weight lid lifter and Bartlett electronic controller with 3 Zone Control panel mounted on an angle for easy viewing. Both features come standard at NO EXTRA CHARGE. There is no other kiln that can match the Tuckers Cone Art Kilns feature for feature.